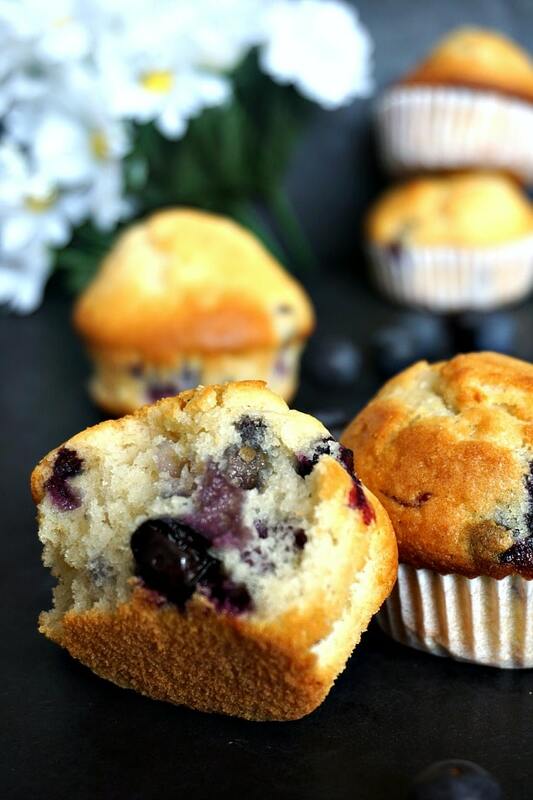 Quick and Easy Blueberry Muffins made from scratch, deliciously golden, fluffy and healthy too. Great as a breakfast on the go, or dessert, these muffins are perfect any time of the day. 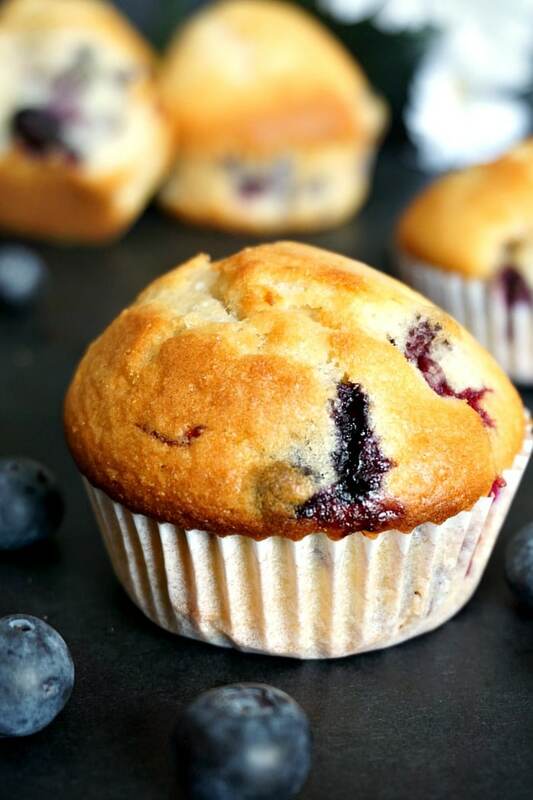 It really does not matter what time of the day it is, and you don’t need any excuses, just grab a few of these super fluffy blueberry muffins and enjoy your day. Great for breakfast or snack time, and if you have a cup of tea or coffee with them, it’s even better. Why are they the best? Because the taste is just right, not too sweet, but not too boring either. The quantities listed below make 12 muffins, but trust me, one batch won’t be enough, they are that good. 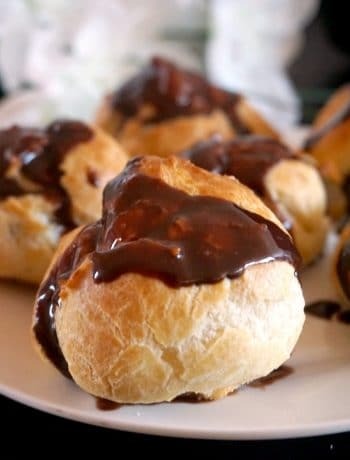 I love muffins of any kind, from naughtier muffins with chocolate chips and jam, or super healthy sugar-free muffins that are perfect for little tummies, like my delicious Banana Muffins. I mean, what’s not to love about them?! It takes maxium 30 minutes to have them on the plate, and you can add absolutely anything to them, the limit is your imagination only. How long do muffins keep fresh? The muffins can be stored in an airtight container and will keep fresh for a few days, although I highly doubt you will have any left, unless you make a super huge batch. We are serious muffin monsters, they always get eaten up the very same day, so I can’t really tell much about how well them keep the days after. Nicer weather soon, hopefully, and they will be the first to go in my picnic basket, no cream to worry about. Have l mentioned that all you have to do is mix all ingredients together? How simple, isn’t it. 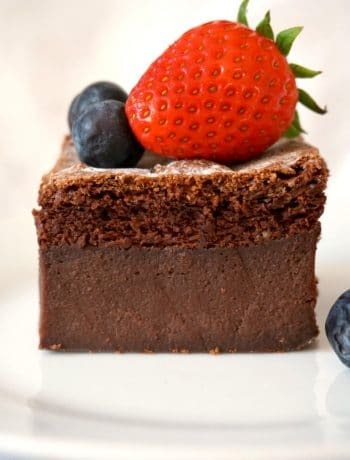 Blueberries are naturally low in sugar, in fact all berries are very good if you worry that some fruit are too high in naturally occurring sugar. They are at their best in summer, but supermarkets sell them all year round. You can add some nuts or seeds too if you like to up the nutritional value. How to get a perfectly rounded muffin top? One thing l used to struggle when l was making muffins was the shape. It was never round, and the muffins were not rising the way l wanted. What helps is mixing as little as possible when incorporating the dry and wet ingredients. Don’t worry about a perfectly smooth batter, a few lumps are fine, they will bake nicely anyway. And make sure the ingredients are at room temperature and the oven is well pre-heated, so they can rise quickly. It’s always better to pre-heat the oven at a high temperature, I usually set it at 220 degrees Celsius (428 Fahrenheit), then lower it to 220 degrees Celsius (390 Fahrenheit) when the muffins are in the oven. Then, add half of the batter into the muffin tins, add 2-3 blueberries, top with more batter to cover the fruit, then add 2-3 more on top. In this way, the muffins rise nicely, and get that nice rounded shape. 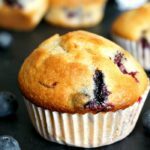 How do you make fluffy blueberry muffins? 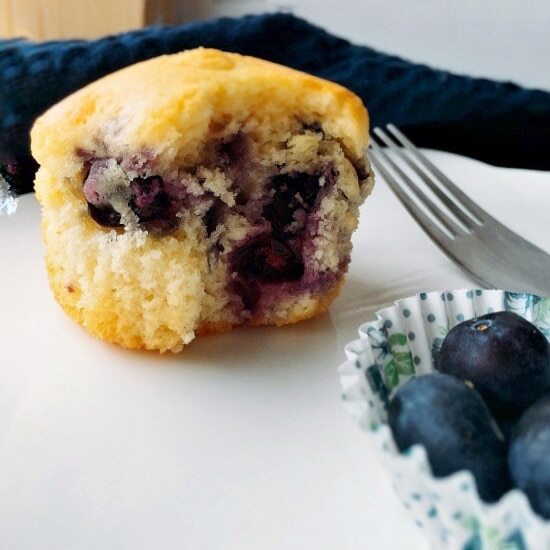 What also helped with the fluffiness is that these easy blueberry muffins are made with oil rather than butter, so they are a lot lighter, and the texture is not dense at all. Of course, getting the temperature right, and avoiding overmixing helps a lot as well, so those steps are not to be missed. If you don’t have muffin paper cases, make sure you grease the tin well with butter or oil, then dust with flour before adding the batter. Otherwise the muffins will get stuck to the tin, and removing them will be a hard job. 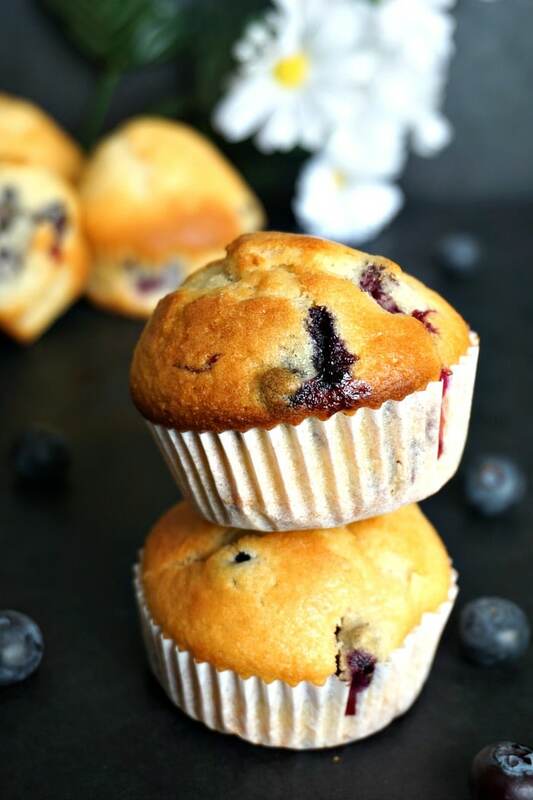 If you’ve liked my QUICK AND EASY BLUEBERRY MUFFINS or any other recipe on the blog then don’t forget to rate the recipe and let me know how you got on in the comments below, I love hearing from you! You can also FOLLOW ME on FACEBOOK, and PINTEREST to see more delicious food and what I’m getting up to. Quick and Easy Blueberry Muffins made from scratch, deliciously fluffy and golden, just perfect with a cup of tea or coffee. A great choice for a breakfast on the go, or a dessert that is less naughty. In a large bowl, add the sifted flour, salt, baking powder and sugar. Separately, beat the eggs until fluffy, add the milk, oil and vanilla extract and mix well. Make a well in the middle of the dry ingredients, pour in the milk mixture and mix everything well to a smooth consistency. Line a muffin tin with paper cases, divide the mixture half of the mixture evenly, top each muffin case with 2-3 blueberries, then divide the rest of the batter between each muffin. You can now sprinkle some more blueberries over the muffins. 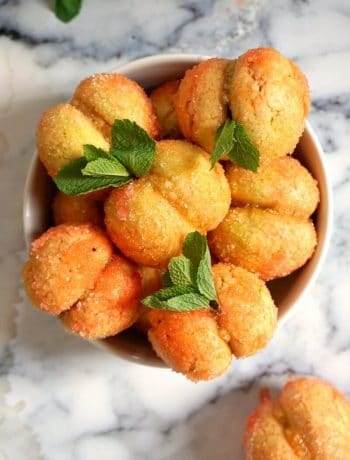 Decrese the oven temperature to 200 degrees Celsius and bake for 20 minutes until golden and firm to touch. Oh my goodness, the combination cherry, white chocolate and coconut sounds so lush. Must try it! Hi Daniela, this may be a silly question but when do you put in the blueberries? I don’t know if I’ve misread the recipe but I can’t seem to find that step.